The owners of the New York Mets are going to trial on March 19, accused of knowingly participating in Bernard Madoff's Ponzi scheme. They deny the allegations. 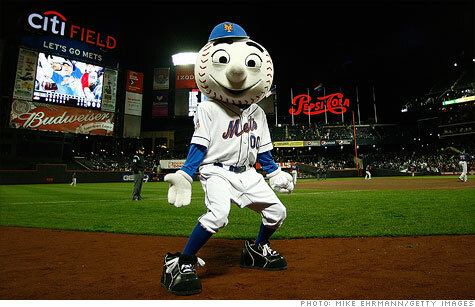 NEW YORK (CNNMoney) -- The owners of the New York Mets may already owe the trustee in the Bernard Madoff case up to $83.3 million -- and they could owe $300 million if they lose in a court case that begins this month. Judge Jed Rakoff moved for partial summary judgment, meaning that the trustee can seek the $83.3 million from the Mets owners, including Saul Katz and Fred Wilpon. Rakoff said the sum represents the profits the Wilpon interests gained in the two years leading to the collapse of Madoff's Ponzi scheme on Dec. 11, 2008. Rakoff's ruling said the exact amount of that judgment will be determined at a later time, possibly after another court appearance. Rakoff also ruled that the trustee, Irving Picard, must go to trial to get the total of $300 million in profits he says the Mets owners obtained through their Madoff investments. The case goes to trial on March 19 in the U.S. District Court for the Southern District of New York. "The trustee and his counsel are aware of the district court order and are in the process of reviewing the decision," said trustee spokeswoman Amanda Remus. The trustee accuses the Mets owners of using "willful blindness" by investing in Madoff's now-defunct Wall Street firm with the full knowledge that it was a pyramid-style scheme. 0:00 / 3:33 Did Poker 'Ponzi' steal my rent? "In short, the principal issue remaining for trial is whether the defendants acted in good faith when they invested in Madoff Securities in the two years prior to the bankruptcy or whether, by contrast, they willfully blinded themselves to Madoff's Ponzi scheme," wrote the judge, in his ruling. Picard originally sued the Mets owners for $1 billion, including $700 million in principal. But in January, the judge upheld his September decision to dismiss the principal portion of the claim. The owners have denied all allegations, saying that they would not knowingly invest in a Ponzi scheme. "We are preparing for trial," read a statement from Sterling Partners, the business entity of the team's owners. "We look forward to demonstrating that we were not willfully blind to the Madoff fraud." Madoff masterminded the largest, most sweeping Ponzi scheme in history, netting about $20 billion from thousands of victims. The trustee has sued hundreds of investors as part of his effort to reclaim stolen assets from Madoff and redistribute them to victims. He's had mixed success so far. Picard's most significant legal triumph was a $7.2 billion settlement with Barbara Picower, the widow of investor Jeffry Picower, who is believed to be Madoff's biggest beneficiary. But he's had some major setbacks. In November, the judge dismissed the trustee's $19 billion suit against JPMorgan Chase (JPM, Fortune 500) and his $2 billion suit against UBS (UBS). Just last month, the judge tossed a $20 billion lawsuit against an Austrian banker, Sonja Kohn, and her co-defendants, who the trustee accused of funneling European investors into Madoff's firm. Meanwhile, Madoff, age 73, languishes in a medium-security federal prison in North Carolina, where he's served a 150-year sentence. He's been incarcerated since March 2009, when he pleaded guilty to running the Ponzi scheme.